So much goodness oozes out of the South. Here are 7 top local Louisiana food products you should try right now. Developed by Louisiana State University in 2009 in an effort to increase rice production in the state, it is the first jasmine rice grown in America. It is sold in 48 states and online, with their main competitor being Mahatma. Jazzmen, is a quaint alliteration of Jasmine. Jazzmen refers to the history of jazz founded in New Orleans. It conveniently sounds the same as jasmine, the Thai long grain rice known for its fragrance and fluffiness. It comes in both white or brown varieties. The company claims it smells like popcorn when you cook it. You’ll have to fill the rice cooker yourself to find out. Louisiana is one of the largest growers of sweet potatoes in the US. The Sour Greek Foods company has decided to extract the sweetness from them to make a better for you sweetener. Think maple syrup, but this is composed of sweet potato juice concentrate, chicory root fiber, honey, plum juice concentrate, organic raw agave nectar, dried carrots, brewer’s yeast, dried turmeric, and cinnamon. Unlike most liquid sweeteners, this one is less sweet, balanced, and has no harsh aftertaste. It also contains more fiber than a typical sweetener, due to the addition of vegetables. This would be luscious squeezed onto pancakes, waffles, yogurt, or for glazing sweet potatoes themselves. Its bright, clean flavor would be welcome most anywhere. As of August 2018, it is soon to be released for sale. Arnaud’s is one of the most famous restaurants in New Orleans, and they are perhaps most well known for their shrimp remoulade, poached shrimp that covered in a thick, spicy, vinegary sauce. Though it appears to have a mayonnaise base, the base is actually creole mustard. What is creole mustard? It is mustard that has additional mustard seeds blended in along with vinegar, hot chiles, and spices. The mustard is not quite as grainy as grainy mustard, not as spicy as hot mustard, and not as pungent as regular mustard. It has a beautiful, mild creaminess with toned down mustard notes. Creole cuisine reflects the influence of the French, Spanish, Germans, Italians, American Indian, and Africans who lived in New Orleans. Some people have a library of mustards sitting on their refrigerator shelves. This is a must add American varietal. Every town has to have their own kombucha brew, and thankfully New Orleans has their own too. 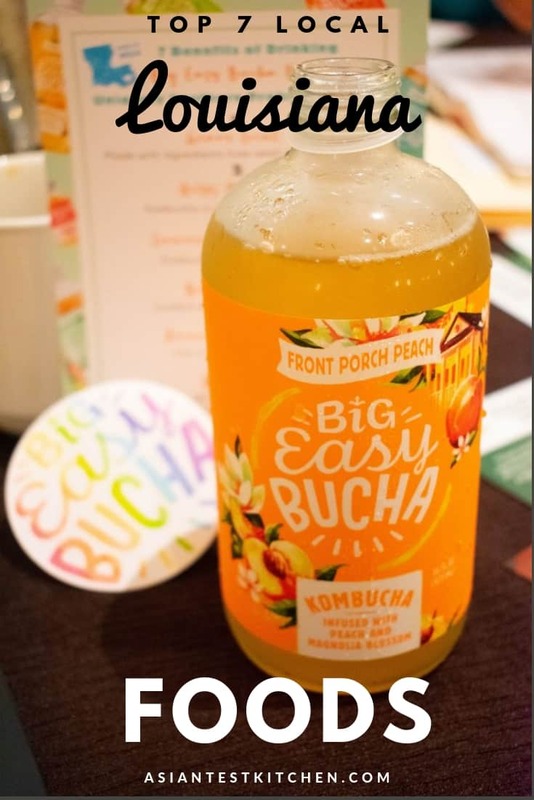 The Big Easy Bucha comes in uniquely southern flavors such as Front Porch Peach infused with peaches and magnolia and Voodoo Brew infused with chicory and vanilla coffee. It is 100% natural with no artificial colors or flavors. Named after their two pet pooches, Bulldog Pepper Jelly was started by two sisters who inherited a farm in Lone Pine, Louisiana from their great grandparents. They grow jalapeno, habanero, and serrano chiles on the farm and use other local ingredients such as pecans and locally grown strawberries for their jellies. Pepper jelly is a southern staple, often a top a cracker spread with cream cheese, served as a party appetizer. However, the company’s hope and vision is that people would use pepper jelly on everything, such as a grill marinade, drizzled on cheesecake, or spooned on top of deviled eggs. Small batch jellies with a bite from a quaint farm in the South definitely sounds like something that could go on everything. Founded by two girls from New Orleans, Greek Girls Rice Pudding is based on a 150 year old family recipe carefully handed down from generation to generation. Artemis and Athena, loved the recipe so much they wanted to share it. It is made with Louisiana milk, Louisiana rice, Louisiana cane sugar, lemon zest, and a healthy dose of cinnamon sprinkled on top. Though very simple, it is surprisingly addictive. In just a few years, it has already managed to gain a cult following. Rice pudding is not a common dessert in New Orleans, where bread pudding reigns supreme. However, rice and cane sugar do have a long history of being grown in the state. The addition of Greek recipes to the already colorful collage of Creole cuisine seems very appropriate. Every major town in America seems to have at least one craft brewery to its name, and New Orleans has Urban South Brewery. The founder sought to combine American flavors with the culture of European brew meisters. Of particular prominence is the Cucumber Lime Gose Beer. A gose beer is German style beer brewed with at least 50% wheat. This one is flavored with key lime juice and locally grown cucumbers. It has a hint of sourness and an unmistaken refreshingness, especially when served ice cold. Conveniently packaged in aluminum cans, these are highly portable and potable. Surely, there are plenty of locally made food products from Louisiana, but it is unfortunate that you cannot buy them in your own grocery store if you live outside of the state. Though it is a mere smidge of the South, these local Louisiana Food Products are still worth mentioning. This is one of three posts written in exchange for a discount at the International Food Bloggers’ Conference held in New Orleans in August 2018. Published on October 23, 2018. Do you feel love the Big Easy? Please spread the Asian ♥ and share!